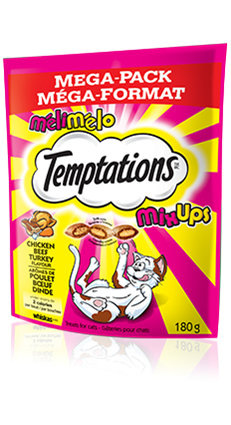 TEMPTATIONS® Mix-Ups Chicken, Beef, and Turkey is rated4.7 out of5 by73. Rated 5 out of5 byKIMLON_3741287545 fromI like the product because my cats love it and it is very easy to ration it as I have 2 cats. I do however have to lock them away because they will try to get into everything to find them. They stare at the cupboard door until they get their treats in the am and then they will eat their ordinary food. Rated 5 out of5 bySONYALNB_3741408642 fromMy 7yr old cat rarely eats treats. Usually he just sniffs them and moves along. My daughter put a couple in front of him to see how he would react and he went crazy! She put down a few more and he gobbled those up as well. We actually had to hide the bag because he kept trying to get into it! Rated 5 out of5 byHALEYPON_3741286279 fromThe advertisements are true - my cats will come running from anywhere in the house when they hear even the crinkle of the temptations treats bag. My cats actually go insane for these treats. I can't speak to the taste myself, but my cats love these, so obviously they must taste pretty good. Rated 5 out of5 byBeQi fromCat goes nutzo!I dont know what they put in these treats but my cat goes bonkers for them. He cries until he gets some. My husband is officially an enabler for his addiction. Get them only if you dont mind constant cries... Or you'll have a fat cat with a treat addiction. Rated 5 out of5 byMICHELGQC_3741408034 fromThe cats go nuts for these treats. I just shake the bag and they both come running no matter what they are doing or where they are in the house. It's a little trick that works well when I need to find them or get them out of a certain area! Rated 4 out of5 byDANIELLEWMB_3741288134 fromMy cat loved these Temptations treats. He gobbled them up quickly and was waiting for more! He knows the sound of the bag and will come running as soon as he hears it. I would definitely purchase again.